The College Dish: 3 new flavors! One comes out on top! A food review blog done by a college kid. Cheap. Tasty. I'll tell you what's going on both in the fast food world and in the aisles at your grocery store. 3 new flavors! One comes out on top! The review is late, but here no the less, and I am proud to say that I was able to sample all three flavors! Yay! The Chicken and Waffles, while being the most interesting and the flavor that i was more excited about trying, it disappointed. The chicken and waffle flavor was present. In fact it seemed a bit to present on the maple side. I could be crazy, but it seemed that in the making of the chip they might have lightly drizzled the chips with a coating of maple syrup, for when i opened the bag and tried to savor the nice crunch you look for in potato chips, i found the crunch was underwhelming and the chips; a bit soft. The chicken presence was there and the overall flavor of the chip was alright, but nothing to write home about. Comments: Not really distraught that it lost. The cheesy garlic bread, came in second place for me. While the flavors were all present and super delicious, the chip wasn't anything out of the ordinary. It was just a cheesy garlic chip. Yes, its taste in comparison to a bread of a similar title that you would find at your local Italian restaurant was virtually the exact same flavor, it was that original of an idea seeing as we've had cheesy chips and garlic chips before. Especially when you consider all of the weird and interesting flavors they have at the Walker's (the UK equivalent to Lay's) over in Europe. 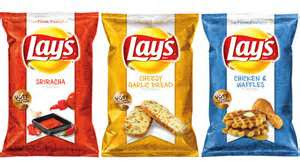 So while the chip was good, and flavorful, i don't believe it should have won the competition seeing as the other two flavors were definitely more interesting. Comments: Good chip! I'd buy it again. The best of the three contenders! The Sriracha chip was flavorful, delicious, original, and had a crunchy-ness that the Chicken and Waffles was lacking.